HPB Presents: Halloween stamped marble | Light Your Nails! This is so pretty! I love the base color and your stamping is perfect! Pretty stamping, Simona! What a lovely base colour too! It's flawless. Gorgeous! 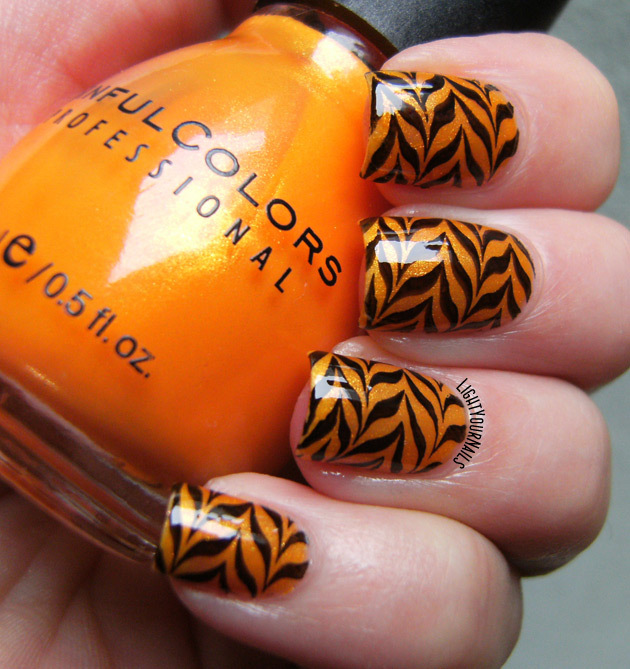 And perfect Halloween mani! E' molto bello sì! Lo uso sempre volentieri! The colors so work for a Halloween mani and your stamping is perfection! I love this mani and stamping! Nella curiosità di sapere quali nail art avevi programmato, dico che questa è stupenda. Mi piace moltissimo questo SC con lo shimmer dorato. Grazie Silvia. Cercherò di ricreare quello che avevo in mente in chiave non-Halloween, ma posso già dire che io e i decals fatti in casa non andiamo d'accordo! This is one of my favorite water marble patterns. I love your mani. Love the marble pattern, I should totally use it some time! Thank you Deborah! It's quite handy for those like me who can't watermarble! These look fabulous!! That base polish is really lovely! This Sinful Colors looks absolutely incredible on you, and the stamping is perfect! 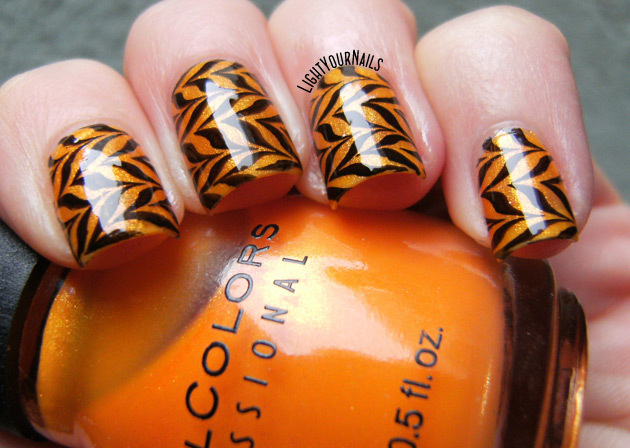 I love how bold these are- they make me wish I hadn't been so lazy about doing Halloween nail art! I love the marble stamp! Beats the heck out of doing it the water way lol. Haha yes! Thank you Rose! I love this stamping job! I hope this type of water marble is easier than real water marbling. I get so frustrated with stamping that I won't even try water marbling. So perfect. With the right stamper I find stamping extremely easy so this way is way easier for me! I agree your stamping are perfect and yes the colours are perfect for Halloween! Love the stamping for this! Beautifully done! I really need to get myself one of these water marble stamping plates... This is probably the only way I could pull off a successful marble! This looks so great! Oh yes, I've seen those! Love them, too!